- and Bordeaux, on 30 June 1881. In Lyon, the network quickly developed and by 1881 subscribers could contact the main police station in an emergency thanks to the connections between the fire brigade and the S.G.T. In Nantes, the telephone was immediately successful. In May 1881, the network covered 20 kilometres and had more than forty subscribers. A telephone was placed at the disposal of the general public in the Stock Exchange building and another one in the Préfecture. In Le Havre there were soon 100 subscribers. In Bordeaux, the network had more than 50 subscribers by the end of 1881. 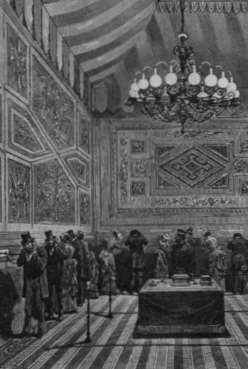 The Chamber of Commerce had a special office equipped at the Stock Exchange where people with a subscription card could call other subscribers. Because of the rapid spread of the network, the S.G.T. opened a 24 hour service from 15 November 1881. In 1881, the S.G.T. increased its operations by buying up Rattier, one of the biggest French manufactories of cables and electrical equipment. However the telephone did not enjoy much success with the general public who continued to regard it as a mere toy without any practical use. 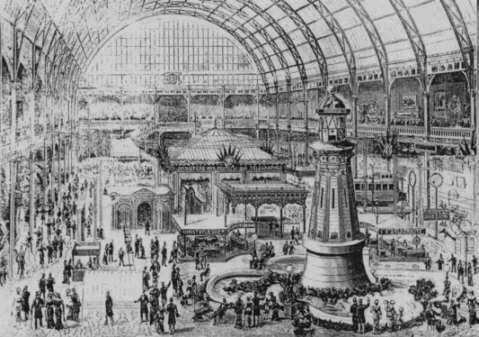 It was not until the 1881 Universal Exhibition in Paris, that France finally discovered it. The S.G.T organised the major telephone event. It set up in the Industry Pavillon a central control room connected to some 30 extensions identified by numbers and disseminated throught the Pavillon. 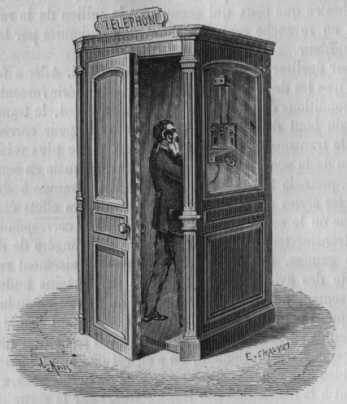 To reduce ambiant noise, each device was placed in a sort of oak booth with padded insides (they were in a way the first public telephone booths). But the most popular feature consisted of telephone recitals from the Paris Opéra house. A contemporary observer describes these recitals as follows. "Inside the Pavillon, two rooms were each divided into two compartments fitted out with some dozen sets of headphones, thanks to which visitors could hear the music from the Opéra House. The effect was magical ! In these austere dimly lit rooms, equipped with a row of headphones placed along the walls, absolute silence reigned. Then, as soon as you lifted the two earphones to your ears, you seemed to be transported directly in front of the Opéra stage. If you closed your eyes, the illusion became complete. It was as if you were in the audience, listening to Lasalle and the great Krauss, hearing the orchestra and the applause of the spectators. All those who heard these recitals were struck with amazement. " This exhibition was a huge advertisement for the S.G.T. which increased its capital to 25 million francs in november 1881. But it was not easy to manage the growing popularity of the telephone and the S.G.T. could no longer satisfy public demand ! On 31 December 1881, 911 subscribers were impatiently waiting for their lines. The company blamed the delays on the government departments which had reserved the construction of the lines and the lack of cables which the manufacturers could not supply in sufficent quantity. Despite all these problems, the S.G.T. ,with its comfortable industrial capacity, continued to develop its networks in the provinces. In February 1882, it set up the Lille network only to face a new and unexpected rival : the French State ! From 1882, the State decided to set up its own telephone networks, as was already the case in Germany and Switzerland. 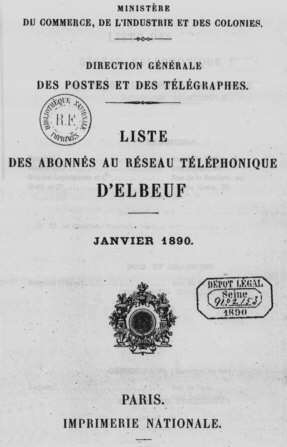 In July 1882, the Post Office and Telegraph Minister obtained a credit of 250 000 francs to carry out an experimental operation of telephone networks in some provincial cities. The licence granted to the S.G.T. in 1879 being due to expire in 1884, this experiment aimed to supply important information about the different systems of operation. The regulations controlling the State-run networks were also laid out in a decree dated 1st January 1883. To reduce State funding, the government accepted the principle of a contribution paid by the subscriber for the installation of the line. The subscriber was to pay a certain sum and there after the State would not charge him an annual subscription rate. The subscription was cheaper than for the S.G.T. network. It was 200 francs for networks with less than 200 subscribers and 150 francs for other networks, but unlike the S.G.T. which supplied the actual telephones subscribers to State networks had to buy the apparatus. The State installed the phone and supplied the batteries and other fittings for a supplement of 75 francs. In the same service in a network of over 200 subscribers, the cost for an S.G.T. subscriber was 400 francs compared to 425 francs for a State network subscriber. The first networks put into place by the State were in Reims and Roubaix Tourcoing on 1st April 1883, followed by Saint-Quentin on 31 December 1883. The first network in Normandy was set up in Elbeuf on 25 November 1884 with 46 subscribers. - and Oran on 10 August 1883. - the State will build and service the networks at the licence holder's expense and can at any time buy up all the private-owned equipment. The licence holder is responsible for placing the telephone lines within buildings, installing the telephone in subscriber's houses and providing a telephone service by setting up exchanges and paying telephone engineers and switchboard operators : "les demoiselles du téléphone". Judging the situation to be somewhat precarious, the S.G.T. reduced its investments. It ceded its Lille network to the State and set up its last network in Saint-Etienne on 15 july 1884. On the other hand, the State-funded operations prospered and in 1884 networks were put into service in Halluin, Troyes, Nancy, Dunkerque and Elbeuf. The first public telephones appeared in Paris and in some cities in the provinces in 1884. These booths were at first placed in some Post Offices and in the main offices of the S.G.T. - S.G.T. subscribers received a telephone card giving them the right to telephone free of charge from all public telephone in S.G.T. offices. - People wishing to subscribe to the public telephone service received an annual subscription card costing 40 francs. With this card, they could telephone from any public telephone, State or S.G.T.